Wondering how to Join ? For the past number of years Ballinrobe Musical Society have been kindly hosted by Ballinrobe Community School. 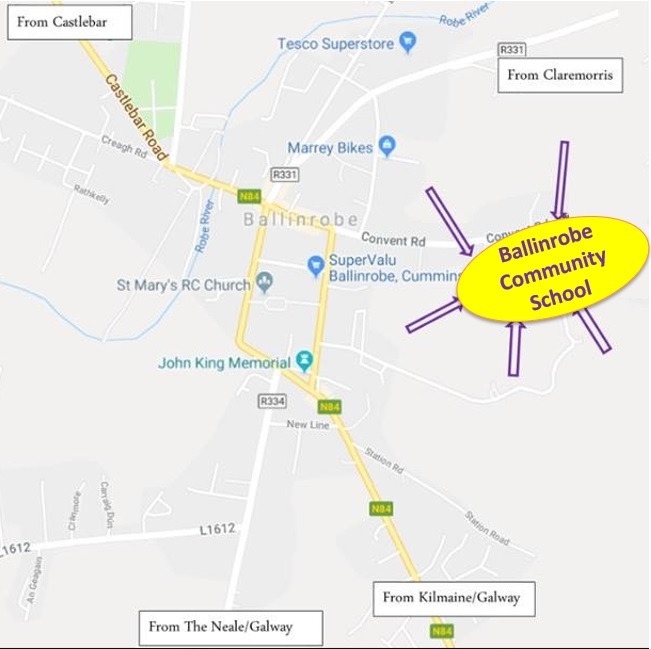 The school is located on the Convent Road in Ballinrobe, Co Mayo. On google maps get directions by entering the Schools Eircode: F31 XD53. Please note mobile phones and pagers must be switched off; no cameras, no recording; smoking and use of electronic cigarettes is prohibited; Management reserves the right to confiscate offending equipment and offenders will be removed without refund; Management reserves the right to refuse admission; ticket holders enter the venue at their own risk and assume all responsibility for their property. The theatre is accessible for disabled patrons. Snacks and drinks available. Raffles will be held at the interval. We thank you in advance for your co-operation and support and we hope you enjoy your visit. © 2015 Ballinrobe Music Society. All rights reserved.